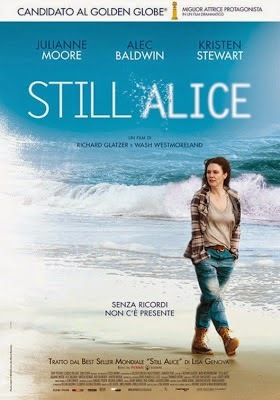 STILL ALICE starts Julianne Moore in as Oscar-winning turn as Alice Howland - a successful College professor diagnosed with early-onset Alzheimer's Disease. The first half hour of the film sees Alice suspect that something serious is behind her sudden memory loss and come to a diagnosis. The second half hour sees the family come to terms with her rapidly deteriorating condition - their bickering, frustration, love but lack of understanding. The final third of the film focuses on Alice's relationship with her youngest daughter, played by Kristen Stewart - a relationship that was fraught when Alice was well, but finds a new sympathy in her illness. Alice herself is alienated from herself and much of the rest of her family. This is the true cruelty of Alzheimer's Disease and in that sense the title of the film is ironic. When you take away a woman's intellect, her memory, her job, her sense of self, what is left? Is this a great performance? It's a good one. And we expect this from Julianne Moore who has been one of our finest actresses for years. No-one would resent her Oscar, although I suspect that, as in the case of Martin Scorsese, that this is a career-gong rather than a specific award. In fact, the performance that really impressed me was that of Kristen Stewart who brings such nuance to her role of the child who took a different path from her academic parents and siblings and yet is open to her mother's illness in a way that these cerebral people cannot manage. Is it a great film? No. There's early promise. I liked the way in which the orchestral score echoed Alice's disorientation, breaking down from harmony into a kind of discordant search for a home note around which to tune the orchestra. But really this is a fairly straightforwardly directed film. The script is also odd insofar as the film seems to just sort of end. And, as in the case of a lot of these chronic illness films, there's a need to martyr the sick rather than show them frustrating and angry, warts and all. Still, for all that, for these two strong central performances, the film is worth your time. STILL ALICE played Toronto 2014 and was released in the USA last year. It opened earlier this year in Spain, Italy, Kuwait, New Zealand, Canada, Hong Kong, Portugal, Singapore, Thailand, Turkey, South Africa, Colombia, Mexico, Norway, Israel, Peru, and Estonia. It is currently on release in Germany, Denmark, Ireland and Bulgaria. It opens on March 12th in Argentina, Brazil, Chile, Greece and the Netherlands. It opens on March 18th in France, on March 20th in Finland & Sweden, on March 26th in Macedonia & on June 27th in Japan.